Bay and bow windows offer a variety of benefits for homeowners. 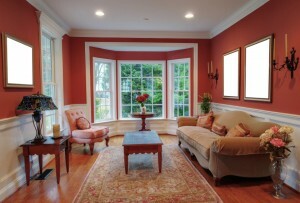 Projecting outward, bay windows allow for maximum visibility and natural lighting for otherwise dark interior spaces. They also add architectural interest to the exterior of your home, create the illusion of a larger room, and allow the option of additional interior seating or storage. Three-dimensional bow and bay windows from Gerald Jones Company add beautiful style and functional livability to any space! The team at Gerald Jones Company is happy to work with you to figure out the perfect type of bay window for your home. Choose from bow windows, a type of curved bay window; oriel windows, a bay window that does not reach the ground and is instead supported by brackets; or a traditional angular bay window, each available in a variety of materials and styles. Gerald Jones Company is committed to learning more about your home’s needs and your personal design preferences. Using this understanding, we will we move forward to create the perfect custom bay or bow window to add style and value to your home in Raleigh-Durham! Contact the Raleigh-Durham window installation experts at Gerald Jones Company to make your vision of a beautiful new bay or bow window for your home a reality. Since 1955, our family-owned and operated business has been committed to providing customers with the highest quality home improvement products and services.